A message to the University community on diversity and inclusion. Being away at college can be a stressful time for anyone. Stress may stem from family, classes, responsibilities on campus, friend conflict, relationship issues, etc. Sometimes we can cope without too much anxiety or interference, but other times stress may cause significant problems or concerns. At times, you may find that, while you are coping with stress effectively, your friends are not. Feeling sad for an extended period of time (crying, feeling fatigued, unmotivated). Talking about wanting to die or wanting to kill oneself. Sudden overwhelming fear or worries. Drastic changes in behavior or personality. Drastic change in eating or weight. Change in sleep patterns—sleeping very little or too much. Withdrawn from friends and social events. Feelings of extreme highs or lows. Strange Thoughts (delusions) / Paranoia. Inability to cope with daily problems. Academic problems, not going to class. Respect his or her personal space. Find an area to talk that is comfortable and private. Let him or her know that you have noticed a change, and you are concerned. Ask if he or she would like to talk about it. Remain judgement-free; just listen to what is going on. Ask if he or she would feel comfortable talking about this with a Resident Advisor, counselor, family member, Greek Life Advisor, etc. Listen carefully and be supportive. (412) 648-7930 — Call to schedule an intake appointment. You can speak to a representative confidentially on the phone or in person at either a comfortable location (dorm, apartment, etc.) or their facility. This is a free service and is for anyone who is experiencing a crisis. We, in the University Counseling Center (UCC), are here to help students transition into the University setting, and support students in dealing with personal, educational, and career concerns. We have found that parents often have questions about how to best help their child through tough times or academic concerns and uncertainty. This Guide has been designed to help you learn about the services we offer and how students can access them. You will find information about common student concerns, links to more in-depth resources, answers to questions frequently asked by parents, and advice on when and how to consult with counselors. Our goal is to assist your child in having the best collegiate experience in the world. We always welcome feedback on how we are doing in achieving this goal both through our students and you, their interested parents! All case information is confidential unless a student has provided written consent for information to be shared with specific people. No one other than authorized UCC staff will be permitted to see student information without informed consent. While it is understandable for parents to be concerned about their child’s well-being and perhaps be informed about his/her treatment, the UCC is only able to share information regarding treatment with the written consent of the student. While consent may be granted, we still encourage students to directly communicate with you regarding their treatment plan, though we are free to directly consult with you as needed about your child’s treatment. We employ a multidisciplinary staff of psychologists, social workers, licensed professional counselors, psychiatrists, and advanced graduate-level trainees in a variety of mental health disciplines. All students who are enrolled at the University and registered for classes are eligible to receive our services, which are provided free of charge. Individual, couples, and group counseling services are offered, as well as seminars throughout the year dealing with issues such as stress management, healthy relationships, and career development. The UCC is located on the 2nd floor of Nordenberg Hall in the Wellness Center. Hours of operation include both daytime and evening appointments to accommodate a wide variety of student schedules. Your child must schedule the first appointment as an initial assessment or “triage.” This can be done by calling the front desk or by visiting the UCC. If biweekly individual or group counseling is indicated as an appropriate treatment option for addressing a student’s presenting issues and concerns, a counselor will discuss our service options after the assessment. When a student has needs beyond the scope of our services, the student can be referred to area mental health agencies and/or clinics that can provide more specialized help. This might, for example, include students with chronic or severe mental health issues. In such situations, our staff will assist with providing referrals to mental health services off-campus. While it is tempting to continue the same role you fulfilled for your child at home, this is a time to allow your child to learn to be independent. The role transition between parenting “at home” and parenting “at college” can often be difficult for parents. While children might not always voice it, there is a need for them to learn to assert themselves and start to discover a greater sense of autonomy. Students need reassurance and comfort as they make decisions and grow in self-identity. While it is tempting to want to make decisions for your child, he/she is best served by learning to deal with the consequences of his/her own choices. The experience itself is often very educational. Your child might experience some challenges related to schoolwork. Students often have to work harder in college in order to achieve the grades they may have earned in high school. Academic challenges might result in stress, frustration, self-doubt, and insecurity about one’s abilities and potential to succeed in college. As a parent, your role is to be your child’s cheerleader, offer support, and encourage him/her to persevere. Students commonly have some difficulties adjusting initially to the academic challenges of college. As students adjust to the workload, they find academic challenges less stressful. While anxiety cannot always be prevented, there are tools that can make it more manageable. If your child is struggling with anxiety, a referral to the UCC would prove helpful. Untreated anxiety can lead to avoidance, isolation, depression and social or academic problems. Counselors will attempt to teach coping skills that will improve the student’s ability to understand and manage anxiety. If medication is deemed an important complement to this treatment, counselors will refer the student for a psychiatric evaluation. Our goal is always to decrease the frequency, intensity and duration of the anxiety so that students can return to their usual level of functioning. People sometimes characterize depression as just “a case of having the blues.” While it might be normal to experience a lower mood as one adjusts to the experience of college, if these feelings persist and cause your child to not function normally, there may be reason to see a counselor to talk about depression. Depression is a very real illness that can cause severe discomfort for those who are affected by it. College students are not immune to the illness and will need your support in order to move toward better health. Depression often causes decreased energy and/or a low mood that causes impairment in a student’s life. Depression can be caused by a number of different factors, including a death in the family, difficulty in adjustment, a loss, trauma and stress, family history of depression, and chronic low self-esteem. Depression does not make you “crazy” and it is not something that one can just “snap out of and feel better.” The good news is that depression is extremely treatable and resources at the UCC are available to help. According to the National Institute of Mental Health (NIMH), 80% of those with depression recover; and for some, that is within a couple of weeks. It’s possible that your child might experience homesickness as they adjust to a new environment, make new friends, and balance academics and social life. The familiarity and comfort of home can seem very appealing. It’s not uncommon for a new student to feel loneliness, concern, worry, and anxiety over whether the transition will be a successful one. You can help your child by being a source of comfort, and by listening non-judgmentally to all of his/her worries. Encourage your child to open up to new experiences and help him/her to see the possible benefits of getting involved in activities on campus. Parents and families can help provide their child with courage and strength in this time of uncertainty. Students’ concerns should be heard and not minimized; the transition to college is significant and needs to be recognized as a true challenge in the life of a student. Most homesickness dissipates as a student continues with the semester. However, if your child is having continued problems and he/she feels their functioning is impaired, you may consider encouraging him/her to seek services at the UCC. I’ve been trying to encourage my child to make a counseling appointment, but he/she doesn’t want to go. How can I encourage him/her to get the needed help? If my child needs to withdraw because of his/her psychological needs, how can you help? What if I want to share information about my child, or inquire about how he/she is doing? How can I verify that my child made and/or kept an appointment? Can the counselor call me to keep me updated on how treatment is going? I want to make an appointment for my child but was told that I could not. Why not? My child is still a minor. Don’t I have to consent to treatment and don’t I have the right to know what happens in the counseling process? My child has been receiving psychiatric services at home and needs to continue to get his/her medication at Pitt. How can he/she make a psychiatric appointment? Help! My son only has a little bit of his medication left and he was told the psychiatrist couldn’t just give him medication until he met her for a full initial evaluation in 2-4 weeks. What do I do? My child has already been diagnosed with Attention Deficit Hyperactivity Disorder (ADHD) and needs to see the psychiatrist for medication. What does he/she need to do to have this happen? I think my child may have an eating disorder. What should I do? How do I help my daughter or son who may have been sexually assaulted? What do I say to my son or daughter who has experienced a traumatic event (e.g., unexpected death of a loved one, physical assault, mugging, etc.)? What if I feel like my child is in danger and is currently experiencing an emergency? I’ve been trying to encourage my child to make a counseling appointment but he/she doesn’t want to go. How can I encourage him/her to get the needed help? After listening to your adult child’s thoughts and feelings in a sensitive, nonjudgmental way, you can instill hope by helping him/her to realize that there are options for help, and that things will not always appear so difficult. Tell him/her that you believe that using resources like counseling is a sign of strength and maturity, rather than a sign of weakness or failure. Give information about the counseling service and prepare him/her for what to expect. If a student is simply not ready to use professional counseling services, suggest other resources like Residence Life staff, chaplains, friends or other trusted adults as a first step in addressing concerns. You can always consult with a UCC professional about your specific concerns. Students, parents, and individuals involved with treatment should contact the student dean’s office for information and assistance with withdrawing due to psychological or medical needs. What if I want to share information about my child or inquire about how they are doing? If your child has signed a Release of Information Form that allows a counselor to speak to a student’s parent(s), you may speak with your student’s clinician. Because information regarding your son/daughter’s treatment will be treated confidentially, a signed release is necessary for specific information to be shared. Our staff can only keep you informed at a level that has been agreed upon with your student, who must have signed the release and be in treatment at the UCC. Because of Pennsylvania Mental Health Law and confidentiality restrictions, we cannot even verify that your child is being seen for counseling without a written release giving specific permission to do so. Even if our staff don’t have a release to share information with you, a parent may request to consult with a UCC staff person to share information about his/her child or speak with the Director or Associate Director to ask questions or voice specific concerns. The therapeutic alliance between the therapist and client is necessary for good treatment. When a Release of Information is signed by a student, you may call to express concerns or inquire about the general well-being of your child. We encourage you to tell your son/daughter about your conversation with the therapist. We also encourage students to directly communicate with you about their treatment so that you don’t feel like you need to call to check on his/her well-being. This reinforces open communication with parents as well as trust in the therapist. We do not initiate calls to parents unless your son/daughter requests it, or we believe it is in the best interest of the student to do so. We require all students to make their own appointments. Students who make their own appointments are already taking the first step towards a positive therapeutic relationship by demonstrating their readiness to engage in therapy. My child is still a minor. Don’t I have to consent to treatment, and don’t I have the right to know what happens in the counseling process? In Pennsylvania, the Minors Consent to Treatment Act establishes that high school graduates, regardless of age, are able to consent to their own treatment without the notification, involvement, or consent of their parents or guardians. My child has been receiving psychiatric services at home and needs to continue to get their medication at University of Pittsburgh. How can he/she make a psychiatric appointment? All students who wish to make a psychiatric appointment must first undergo an initial assessment interview with a counselor and begin individual counseling before being referred for psychiatric services. Because of the high demand on psychiatric services, students who receive these services must be engaged in therapy with a staff therapist who provides psychotherapy and case management services. Students who do not wish to engage in psychotherapy and wish to receive only psychiatric services will be assisted with referrals to providers of psychiatric services located off-campus. Help! My child only has a little bit of his medication left and he was told the psychiatrist couldn’t just give him medication until he met her for a full initial evaluation in two to four weeks. What do I do? Our psychiatrists will not prescribe medications without first evaluating the student and establishing a treatment relationship. Our policy requires that students first undergo an initial assessment interview with a counselor and begin individual counseling before being referred for psychiatric services. This process may take 2-6 weeks from the time of the initial request to begin UCC services. Students may be able to obtain a psychiatric evaluation and medication management if they establish a new treatment relationship with a psychiatrist or psychiatric provider off-campus. New students who have already been prescribed psychiatric medication are advised to seek prescription renewals from the provider who was managing their medication prior to coming to Pitt (e.g., psychiatrist, psychiatric provider, primary care provider) until the student can establish a treatment relationship with one of our psychiatrists or a psychiatric provider located off-campus. Students who wish to establish a treatment relationship with a psychiatric provider off-campus may contact us for assistance with appropriate referrals. My child has already been diagnosed with Attention Deficit Hyperactivity Disorder (ADHD) and needs to see the psychiatrist for medication. What does she need to do to have this happen? If your child has already been diagnosed with ADHD and is already on medication, he/she will need to make an appointment for an initial assessment interview with a UCC counselor and be willing to engage in individual counseling services in order to be referred for psychiatric services. Students previously diagnosed with ADHD are advised to provide documentation of the diagnosis (including psychological evaluation information that generally includes psychological testing) and medication history during the initial assessment interview. It’s important that this documentation includes appropriate psychological testing information to support the diagnosis as well as up-to-date information about medications prescribed previously and details about the psychiatric or medical providers who provided medication management. This documentation must be provided to us before a student can be referred for a psychiatric evaluation. Many students prefer to continue to have their current medical professional continue to write scripts for them and can bring these scripts to the Student Health Service Pharmacy to be filled. We strongly encourage students with ADHD to register with Disability Resources and Services so that additional accommodations may be made for them. If you suspect your child may have ADHD, they will need to have a complete evaluation before being referred to psychiatric care for medication. We do not provide testing for ADHD, but will provide referral resources if desired. Once the necessary testing and documentation is available, and if medications are warranted, the therapist will make a referral to the psychiatrist. The student must be willing to see the therapist at least once per term for case management and more if it is part of their psychiatric treatment plan. Some students will choose to see their home PCP or get a direct referral to an outside psychiatrist who is willing to diagnose and prescribe for them. They can get referral resources either through us or from their insurance company. Please note that Student Health Service will not write prescriptions for Class 3 medications, commonly prescribed for ADHD. If you think that your child is restricting caloric intake, bingeing, vomiting, making repeated statements about weight or body image, using laxatives/diet pills/diuretics and/or over-exercising, express care and concern about your child’s behavior. Recognize that an eating disorder is serious. Ignoring the eating-disordered behavior will not make the behavior disappear. On the other hand, it’s not a good idea to try and “do therapy” with your own child. Instead, encourage your child to seek assistance from trained professionals at the UCC and/or University Student Health Service. Avoid overly focusing on your child’s weight or looks. Avoid blaming him/her for the disorder. Instead, engage in an open dialogue about feelings. Anticipate that your child may be hesitant to seek treatment. Recognize also that recovery is a process and relapses may occur. If you would like to consult further, feel free to contact us and request to speak with a counselor. We utilize a team approach to treating students with eating disorders, that includes collaboration and consultation between the counselor, the medical provider, and a dietitian to provide comprehensive care for students with eating disorders or eating concerns. Listen and let your child express his/her feelings. Contact the Coordinator of Sexual Assault Services at the UCC at 412-648-7930. She can provide you with information concerning your child’s safety, medical attention, reporting procedures, and appropriate resources. Also, encourage your child to speak with Sexual Assault Services Specialist for supportive counseling, assistance with seeking medical attention, and information about legal options. However, let your child make his/her own decisions. Assist your child in contacting the resources she/he wishes. Listen to your child and normalize the feelings expressed—shock, fear, anxiety, confusion, anger, etc. Contact us at 412-648-7930 to consult with a counselor about your child’s experiences and for information on how to assist your child in seeking appropriate medical attention, legal assistance, academic assistance, and mental health support. Encourage your son or daughter to contact us to speak to a counselor for crisis support and to begin on-going counseling. Supportive counseling can help your child cope with feelings associated with a traumatic event. 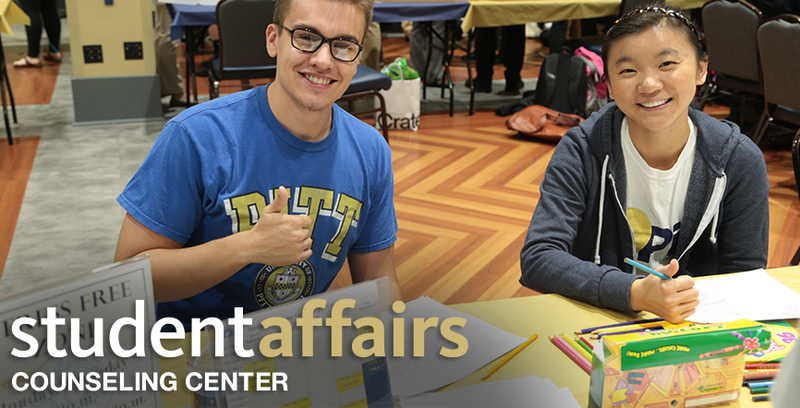 If you’re worried that your child is in immediate danger, we encourage you to call the Pitt Police at (412) 624-2121 to check on them—if they live on campus. You can also consult with the Pitt Police about which police station to call if your child lives off-campus. If you don’t think there is an imminent threat to your child’s safety, you can contact Re:solve Crisis Network, a local crisis agency that could conduct a confidential wellness check for your child. The use of alcohol and drugs is a problem that is present at many universities. The serious problems that students encounter with substance abuse may follow them after college—and in some cases, cause a student to withdraw from school. Students with substance abuse issues are often difficult to handle due to their denial of the problem. Some warning signs will present themselves in your classrooms and during advising. Any one symptom may be misconstrued as its own problem. Identifying symptoms in combination, however, allows you to view the situation as a possible substance problem. Bringing it to the student’s attention may help intervene in the further progression of the issue. Addressing the concern requires some patience and persistence because denial of the problem is a predominant feature of substance abuse issues. When approaching a student about substance abuse, be sure to communicate your caring and concern for his or her well-being, while speaking honestly about your observations. Sticking to the facts of your observations will help combat the defensiveness you may be met with. Encourage the student to seek services at the UCC.